Students Visit New National Museum of African American History and Culture History and film students find inspiration at new museum and other DC sites. College of Arts and Sciences double-alum Lonnie Bunch (BA history ’74 and MA history ’76) is opening the doors of the Smithsonian’s newest and highly acclaimed museum to AU students. 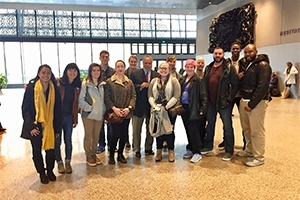 Students in this spring’s Producing the Historical Documentary class recently visited the National Museum of African American History and Culture, where Bunch is the founding director. Bunch greeted the students when they arrived, and then curators Mary Elliot and Rex Ellis led them on tours of the museum’s collections. The Producing the Historical Documentary course challenges students to produce a five-minute historical documentary on a subject related to the African American experience. The visit to the NMAAHC gave students behind-the-scenes information and access to the museum’s world-class collections and scholarship. Curator Mary Elliott with students. Kraut praised Bunch and the museum staff for offering the country a rich contribution to the history of the United States and the African American experience. “I look forward to an ongoing collaboration between the NMAAHC and American University faculty and students," he said. Curator Rex Ellis and students. The class doesn’t stop at the NMAAAC. Students also visited the Library of Congress, where they learned about all of the historical resources available to them. And later in the semester, they will tour important sites in African American history in the DC area, led by Edward Smith, assistant anthropology professor and founder and co-director of the American University Civil War Institute.